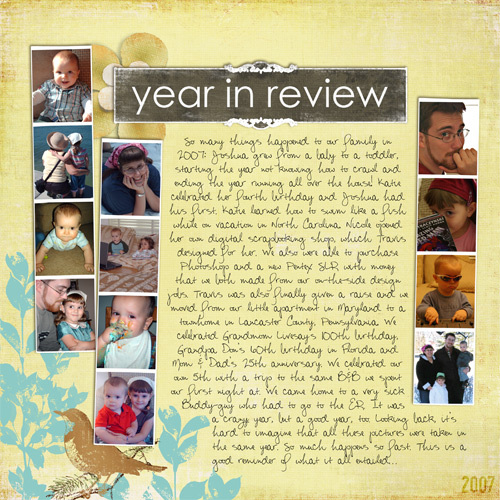 all the little stories» Blog Archive » year in review. It really was surreal to open up the first photos from January 2007. I thought for sure I must have been in the 2006 folder by mistake. It’s amazing what happens within one year. I highly recommend you try a little exercise like this, too! It’s actually a little shocking–in a fun way. I’ve been thinking that I’d like to try that 365 day photography project sometime. I think for me, I need to start small. Travis and I have been talking about doing this for a month as a start (February sounds good to me!). Also helpful for blogging material, since I don’t have nearly as much to say here as I once thought I did… Ha! So, you might start seeing some more snapshots soon. Hope you enjoy that! This entry was posted on Thursday, January 17th, 2008 at 11:39 am and is filed under family, just life, scrapbooking. You can follow any responses to this entry through the RSS 2.0 feed. You can leave a response, or trackback from your own site.